Speaking of Domhnall Gleeson - just a post ago he was shivering in a pair of swim trunks on the set of Brooklyn and now here he is collapsed in a raft in a scene from Unbroken. I totally spaced about the Angelina Jolie directed film. Gleeson is in that as well; playing one of Louis Zamperini's crewmates in the story of the Olympic runner taken prisoner by the Japanese during World War II. Based on the book from Laura Hillenbrand (SeaBiscuit - hey, my kid was a background actor in that!) 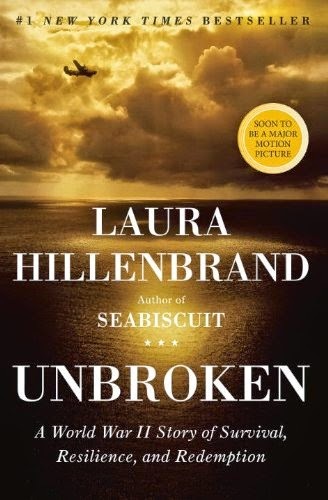 Unbroken also stars Jack O'Connell as Zamperini, Jai Courtney, Garret Hedlund, Luke Treadaway and a slew of other handsome young Hollyood actor types. From even a quick visit to her Australia set, it's obvious that Jolie has a deep respect, if not reverence, for Zamperini — Pitt even commissioned an oil painting of him for a Christmas present to Jolie — and Hillenbrand. The author is a consultant on the movie, has read many screenplay drafts, and frequently talks to Jolie. "It's a huge responsibility," Jolie said. "And I'm constantly asking questions. 'How do you really catch a shark? What does the liver look like? How do you eat an albatross? How do you sink a plane?'" To bring her ideas to life, Jolie hired some of Hollywood's top department heads, including "No Country for Old Men" cinematographer Roger Deakins and "Life of Pi" editor Tim Squyres as collaborators. Last month, at a convention for theater owners in Las Vegas, Jolie showed several minutes from the film, which suggested "Unbroken" will have both a glowing, Americana feel — particularly in its depictions of Zamperini's youth — and a much darker rendering of the prison camps, which call to mind Sebastião Salgado's grimy photographs of Brazilian gold miners. "In the end, its message is one we all need now more than ever — the journey of a man finding his way through the darkness and into the light," the filmmaker told the exhibitors, adding that the film had particular modern resonance as Zamperini is "someone who helps to remind us all what each of us is capable of." That in mind, let's watch the "trailer". Sorta. It's actually a hybrid of a docu-style promo piece they made to coincide with the Olympics - maybe you saw it? It features the real Zamperini talking to Tom Brokaw intercut with footage from the film so it's lacking in any dramatic rhythm and cohesion.I'll share the real deal when it comes out; unless I space out on it too. It's on my radar now though especially as early reports seem to be fairly glowy. Best of luck to Jolie as her directorial debut Land of Milk and Honey wasn't a huge hit financially or critically. Unbroken comes out Christmas Day 2014.